The presence of cacao in ancient Mesoamerica dates back to the Pre-Classic civilization of the Olmec. Archeologists have been able to study the presence of cacao in ancient Mesoamerica by debunking hieroglyphs, discovering artifacts, and chemically testing for cacao residue. From their studies, they have been able to discern that cacao played an intimate role in ritualistic religious practices. Evidence shows cacao being incorporated in a myriad of ancient ceremonies like marriage, burial, sacrifice, and shaman initiation, dating from the Pre-Classic age through Post-Classic Mesoamerica. The focus of this piece is to explore, further, the connection between cacao and religious practices in ancient Mesoamerica by way of artifacts found by archeologists. Religion played a massive role in the everyday of people in Mesoamerica, as I have come to find out, cacao did too. The first step is understanding what cacao meant to religion is to better understand what exactly the people of the time believed in. It is important to clarify that,“cacao” for the purpose of this paper is starkly dissimilar to chocolate. The processes ancient Mesoamericans used to consume their cacao were very simple, not many ingredients whatsoever, compared to the cacao to chocolate processes of today. We use it as a decadent treat, whereas they used it primarily as a stimulant (McNiel 82). There was a focused purpose when someone consumed cacao, purposes stated in the preceding section. The ancient Mesoamericans, in particular the Mayans, held cacao in such a high-regard that the importance of cacao of the time was akin to maize (Mahony). It is well understood that maize was more integral in the everyday diet of the Mayan people, however, maize was not integral in the ceremonial processes of the time. Cacao represented much more than sustenance, there was a sacred component to it which is why I became interested in discovering its relationship with cacao in Mesoamerica. Religion throughout ancient Mesoamerica has remained fairly consistent beginning with the Olmecs, moving to the Mayans, and ending with the Aztecs. Professor Davíd Carrasco, who studies specifically Mesoamerican anthropology at Harvard, suggested this assertion to me through a book recommendation and I find the thesis of the book very compelling. Professor Carrasco turned me to Peter Berger’s Sacred Canopy which aims to tackle the question, “Why did people believe what they did?” When discussing ancient Mesoamerica his primary contention and explanation was “As above, so below” which basically means that ancient Mesoamericans thought that the happiness or discontent of the gods was directly reflected in their earthly ongoings (Berger). In other words, they believed that life was being played on two different levels simultaneously: one being their autonomous action and the other being the will of the gods in the other world. This is commonly referred to as “duality” in anthropology. They used religion to explain the ongoings of the natural world. As a result we have seen a repetition of ritualistic archetypes from all ancient civilizations in attempt to garner the favor of the gods. Even through the years it is noted that the Nahuas made a cacao sacrifice to an effigy of Jesus Christ that the spaniards brought in (Mahony). This offers even more evidence of their religious practices remaining consistent even through severe transition. All in all, Berger makes a compelling argument as to why ancient Mesoamerican belief has been rather consistent. The repeated ritualistic archetypes to appease the needs of the gods is where we find chocolate in ancient Mesoamerica. Burial ceremonies were religious in nature (Prufer). Their understanding of death was that it was more of a beginning than an end. Death embarked one’s journey into the other world. In an ancient burial ground dating back to the 5th to 4th century there was a bowl uncovered that had chemical tracings of cacao, discovered in what would have been ancient Maya. The bowl was thought to have possessed the ritual sustenance for that person’s travel into the other world (Prufer). As the person died and moved on to the next life the cacao was the fuel that allowed them to successfully travel to the other worldly side. Consequently, the people that were still alive would continually make sacrifices in order to gain the favor of the past relatives, cacao deities, and other agricultural deities. Copán is a famous archeological site located in current day western Honduras, in the 5th to 9th century it is understood that they were a part of the Mayan civilization. This site is one of the most famous locations connecting religion to chocolate by way of physical artifacts and hieroglyphs. In Copán we see diagrams and hieroglyphs of cacao trees and other agricultural deities. An interesting discovery in Copán was that the cacao tree was used to help depict their ancestry. Furthermore, there were artifacts that correlated people whom were still alive putting multiple sacrificial ornaments in their past relatives’ tombs. The connection with their ancestors which played a massive role in their religion (McNeil). They would pay respect to the dead and they looked upon their ancestors as having almost god-like impact in the other world, they Mayans would look to their ancestors alongside deities to help them protect and maintain their cacao storages. As a means of protecting their ability to successfully complete their ritualistic practices both religious and social. I have been very interested in exploring the roots of Mesoamerica because they are my ancestors. Their belief system being so closely tied in with chocolate of all things is fascinating.The implications of rituals has had dramatic effects throughout all ancient Mesoamerican history, it was fruitful finding where cacao finds it place in these repeated archetypes. Berger, Peter L., 1929-2017. The Sacred Canopy; Elements of a Sociological Theory of Religion. Garden City, N.Y. :Doubleday, 1967. Print. Rosenswig, R. M. (2008), Cacao in Mesoamerica: A Culture History of Cacao ‐ Edited by Cameron L. McNeil. Bulletin of Latin American Research, 27: 435-437. Mahony, Mary Ann. “Cacao in Mesoamerica: A Cultural History of Cacao (review).” Enterprise & Society, vol. 11 no. 1, 2010, pp. 175-177. Prufer, Keith M. W. Hurst, Jeffery; Cacao in the Underworld Space of Death: Cacao Seeds from an Early Classic Mortuary Cave. Ethnohistory 1 April 2007; 54 (2): 273–301. But from where does this trope stem from? Did someone just see a devastated, heartbroken woman and decide that the best course of action was to give her a plastic container full of sugar bombs to heal her pain? To start and investigate this question we can look before the iconic chocolate box, before even the concept of a chocolate box itself, and find that Aztec and Mayan beliefs about the spiritual and healing nature of cacao provides the foundation for modern beliefs on the properties of chocolate. Similarly, in the Madrid Codex, gods are even depicted showering their blood over cacao pods in a powerful demonstration of their close relationship with cacao (Coe, The True History of Chocolate). Furthermore, according to David Carrasco, this relationship between the gods and cacao emerges in Mayan religion, as well. According to Carrasco, the Mayans believed that trees, such as the cacao tree, served as “metastructures of the heavens,” through which the roots connected gods to the underworld, the trunk placed them in the world, and the branches extended up to the heavens (Carrasco, Religions of Mesoamerica). Therefore, the Mayan association of cacao to the gods demonstrates their belief of cacao being spiritual. Ancient Aztec religion also placed cacao on a spiritual level. 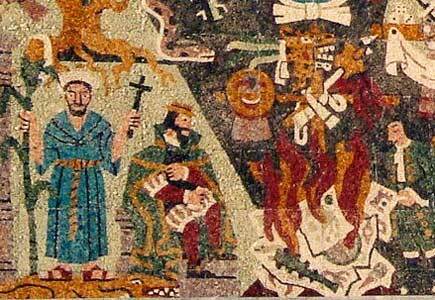 It is depicted on a ritual book called the Codex Féjérváry-Mayer where it is part of a cosmic diagram. It also took prominence in metaphors used by Aztec religious figures, in which they referred to chocolate as “heart, blood.” (Coe, The True History of Chocolate). Thus, the prominence of cacao in Aztec rituals highlights their association of cacao with spirituality. Furthermore, the Aztec and Mayan belief in the spirituality of cacao extended past just the metaphysical plane, and into everyday life. They believed in the ability of cacao to nourish not only the bodies, but also the spirits of their people. The Maya believed that cacao drinks contained “powerful physiological effects,” causing “virility, strength, and the fortitude to undertake physically demanding feats, such as marching to war” as depicted in this image of a warrior alongside a cacao tree laden with cacao pods (Leissle, Cocoa). They also believed that the health boosting properties of cacao extended into fertility—thus, as evidenced in this image of a marriage ceremony, cacao played an important role in marriage rites, not only as currency in the bride’s dowry, but also to promote fertility. The Aztecs similarly believed in the beneficial effects of cacao on the body. Aztec society highly condemned drunkenness—a sin they deemed punishable by death. Therefore, instead of their alcoholic drink, octli, they revered cacao beverages as a healthier and more virtuous alternative (Coe, The True History of Chocolate). These beliefs that chocolate could nourish and revitalize the body demonstrates the translation of the spiritual nature of cacao into tangible benefits in the human body. Therefore, by looking into Mayan and Aztec attitudes and associations with cacao, we can see that these ancient civilizations formed the foundation of belief around the healing and spiritual properties of cacao that still exist today. But how did these ancient ideas stand the test of time to exist in today’s society? Examining interactions between colonizers and the Mayans illuminates the way these ancient beliefs migrated through time and space. When colonizers came from Europe to mesoamerica in the early sixteenth century they encountered not only the Mayan people, but also their foods and beliefs. Among these foods were cacao, which was highly prevalent in Mayan society at the time as both a currency and a revered form of food. Through interactions with the Mayans, the Spanish colonizers adopted beliefs around the spiritually and physically healing properties of cacao. As cacao distribution spread as part of triangular trade, which brought goods and slaves between continents across the Atlantic, as shown on the diagram below, this belief spread through European society. In the early seventeenth century an ailing Alphonse de Richelieu brought chocolate to France for the first time in the hopes that it would help his problems with his spleen. We can continue to track the belief of the healing and spiritual nature of chocolate a few centuries later by looking at the U.S army’s use of chocolate rations in the second world war. The U.S. developed a sustenance they called the “D-ration bar” to maintain the energy and health of their troops. The D-ration bar contained “a blend of chocolate, sugar, cocoa butter, skim milk powder and oat flour” and was used, alongside other candy, to keep up the morale and overall nutrition of the troops (Butler, D-Day Rations). Thus, this application of chocolate to keep allied warriors going demonstrates the foundation of Aztec and Mayan beliefs around chocolate to influence the use of chocolate in modern civilization to boost nutrition and aid warriors. It’s easy to look at chocolate and only see the candy. However, cacao has a long history of colonization, abuse, and enslavement—much of which still exists today. It’s important to remember the history of cacao to remember that our culture does not exist in its own vacuum, but has been influenced by those who lived before us. Part of this reflection is recognizing that so much of what we have has been colonized from other countries and cultures and assimilated until they wear only the label of “today.” While some may just see a heartbroken girl eating chocolate to heal herself, remembering the Mesoamerican foundation of beliefs on which our associations stand can allow us to see more than just a trope. We can see the connection between us and cultures from different parts of the world and different eras in history, helping us remember that our experiences are inextricably linked to those around us. Butler, Stephanie. “D-Day Rations: How Chocolate Helped Win the War.” History.com, A&E Television Networks, 6 June 2014, www.history.com/news/d-day-rations-how-chocolate-helped-win-the-war. Carrasco, David. Religions of Mesoamerica. Waveland Press, 2014. Coe, Sophie D.. The True History of Chocolate . Thames & Hudson. Kindle Edition. Leissle, Kristy. Cocoa (Resources) (p. 31). Wiley. Kindle Edition. Martin, Carla. “20190206 Mesoamerica and the “food of the gods”” Chocolate, Culture, and the Politics of Food, February 30, 2019, Emerson Lecture Hall, Cambridge, MA. “Maya Civilization.” Civilization.ca – Haida – Haida Art – Masks, Canadian Museum of Civilization Corporation, www.historymuseum.ca/cmc/exhibitions/civil/maya/mmc01eng.html. “Aztec Possum God and Cacao Beans.” The Possomery, members.peak.org/~jeremy/possomery/. Ramirez, Jason, director. Legally Blond “LIAR”. YouTube, YouTube, 3 Oct. 2011, www.youtube.com/watch?v=pGauMKoX3JE. Sergov, Gerasiminov. 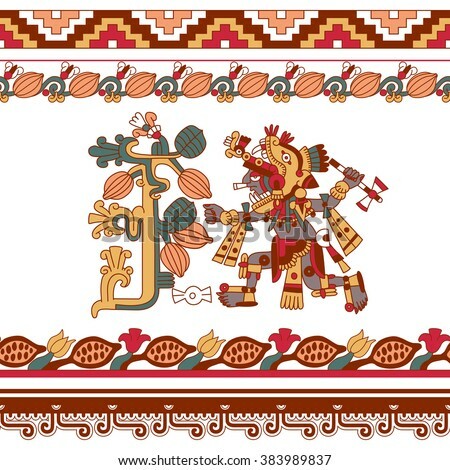 “Sketch Drawing Aztec Pattern Cacao Tree, Mayan Warrior with Tomahawk, Cacao Beans and Decorative Borders Yellow, Red, Green, Brown, Grey Colors on White Background .” Shutterstock, vector illustration sketch drawing aztec pattern cacao tree, mayan warrior with tomahawk, cacao beans and decorative borders yellow, red, green, brown, grey colors on white background . Cacao seeds, the source of chocolate, don’t often figure as a divine substance in the modern word. However, cacao holds ancient significance as food of the Gods for the Mayan. The world of the Ancient Maya was in many ways built on chocolate. Today, many understand that chocolate was a drink for kings and nobles. There are dozens of Classic Maya pots and jars that depict chocolate as part of a ritual or feast (Presilla 12). Indeed, the Maya incorporated chocolate into their lives daily. Furthermore, they were among the first people to uncover the intricate process of creating and refining cacao seeds into chocolate drink. However, cacao operated as much more than just a food source; the Mayans used it as currency and wrote it into their creation myth. The Popol Vuh and the Dresden Codex offer a window into the ancient significance of cacao, connecting it to cultural identity. The act of processing cacao beans, roasting and grinding them, is not only a cooking process but also deeply connected to a symbol of re-birth and power, due to its framing within a creation epic. Cacao is thus a spiritual food deeply connected to the identity of the Maya. Cacao’s origins begin with the Mayan civilization and the creation of chocolate beverages. According to Maricel E. Presilla, the Maya “consumed the pulp itself and juice made from the cacao fruit pulp (Presilla 12). Additionally, inscriptions from drinking vessels outline a clear culture of drinking cacao, as the Mayans used terminology such as ‘tree-fresh cacao’ and ‘green cacao’ in order to describe certain tastes or preferences (Presilla 12). Historians have uncovered many vases and vessels, such as a painted pottery jar from a tomb at Río Azul, Guatemala. The vessel depicts a chocolate drinking being made and further shows the process of pouring the substance from one vessel into another “to raise the foam” (Coe 48). Thus, artifacts reveal the intricate care and use of chocolate; the Mayans were so particular about their chocolate routine that even specific moments in the process feature in art. In addition to the clear culture of cacao consummation, cacao plays an instrumental within the Maya creation story. The story centers on the journey of the Hero Twins Hunahpu and Xbalanque in a world that precedes the present. Their father, Hun Hunahpu was killed in Xibalba (the underworld) after he and his brother lost to the Lords of the Death in a ball game (Grofe “Xibalba: About”). Hun Hunahpu’s head is placed in a barren tree which magically begins to bear new fruit. According to Michael Grofe, this tree is depicted as a cacao tree, the beans of which make the chocolate drink that the Mayans enjoyed. Ultimately, the Hero Twins fall into a trap from the Lords of the Death who trick them into jumping into fire; they are burned and the Lords dump their bodies into the river. However, the Twins come back within five days as fish. They defeat death and bring about creation (Grofe). Thus, within the story is also the story of cacao. Like the twins returning to Xibalba, chocolate comes from beans which is roasted, refined, and poured into water, only to create something completely new. The Maya word “kakaw” is spelled with two fish glyphs, further emphasizing the connection between the cacao process and the magical story of the Hero Twins (Grofe “Xibalba: About”). According to the scholar Michael J. Grofe, in the “the famous Rio Azul cacao pot, we find both the two ‘ka’ glyphs together with the reduplication symbol, as well as the final syllable ‘wa’, spelling ‘kakaw’. It therefore seems likely that the story of the Hero Twins transforming into ‘two fish’ derives from a pun on the word ‘kakaw’” (Grofe “Xibalba: About”). Grofe explains the sacrifice of the Twins as parallel to “cacao processing: entrance into the underworld (burial, fermentation), burning (roasting), grinding of their bones on a metate, and pouring them into water” (Grofe “Recipe” 1). Ultimately, Cacao, through symbolic and mythological writing thus serves as a powerful representation of re-birth, underscoring the cultural significance of cacao to the Maya who used it regularly. The Dresden Codex further illuminates the significance of cacao in literary Mayan culture. The Codex is a “folding-screen book” and in several sections “gods can be seen holding cacao pods, or dishes heaped with cacao beans” (Coe 41). In addition, the Dresden Codex specifically connects gods to cacao; according to Sophie and Michael Coe, “the Opossum God travels a sacred road to the edge of the town carrying the Rain God on his back, while the associated text tells us that ‘cacao is his food [kakaw u hanahl]’” (Coe 42). 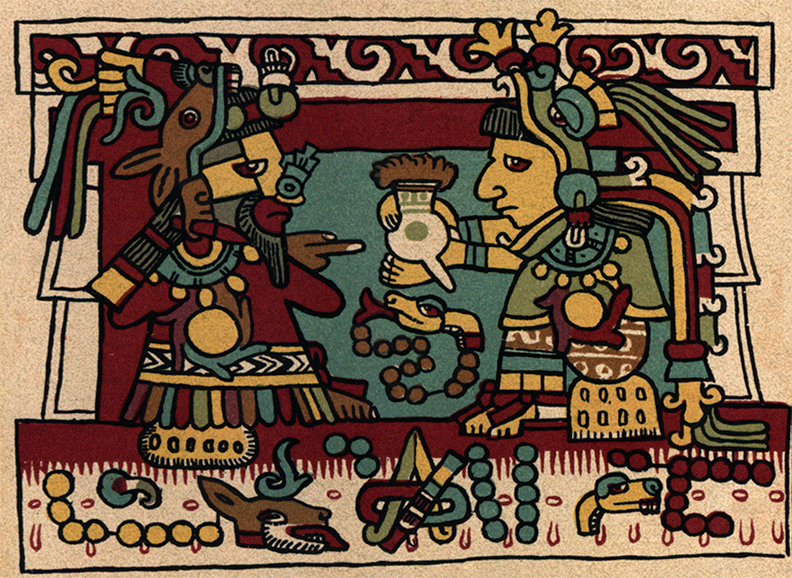 The Mayan Gods, as depicted in the Dresden Codex, have a clear reverential relationship to cacao. Ultimately, cacao seeds are not merely food, but a divine life source, and connected to the what it means to be Mayan. Coe, Michael D. True History of Chocolate. Thames & Hudson Ltd, 2013. Grofe, Michael J. “The Recipe for Rebirth: Cacao as Fish in the Mythology and Symbolism of the Ancient Maya.” Foundation for the Advancement of Mesoamerican Studies, 15 Apr. 2009, http://www.famsi.org/research/grofe/GrofeRecipeForRebirth.pdf. Grofe, Michael J. “Xibalba: About.” Xibalba Cacao, Michael Grofe, http://www.xibalbacacao.com/index.htm. Presilla, Maricel E. The New Taste of Chocolate: a Cultural & Natural History of Cacao with Recipes. Ten Speed Press, 2009. Depicted in various Mayan artifacts, cacao along with its various forms were interwoven into Mayan society. From rituals to everyday life, cacao seemed to have an immortal presence in Mayan society, so much so that it found its way into Mayan religious paintings that depicted cacao beans or cacao trees intertwined with the Gods. In the picture below, the Maize God, a central deity in the Mayan religion, is seen shaping himself as a cacao tree, and pointing at what seems to be a vessel holding liquid cacao: “His limbs are studded with ripe cacao pods, and his skin is marked with wavy ‘wood’ motifs. Clearly, an anthropomorphic cacao tree is at hand” (Simon Martin 155). The Maize God, a central deity in the Mayan religion, depicted as a cacao tree on an ancient Mayan bowl. Along with the Maize God, cacao seems to also play a central role in other Godly tales, but why? Why did cacao play such an important part in Mayan theology? The answers lie in the very same picture above. This artifact highlights how the Mayans used the story of the Gods to explain the world around them, and ultimately, how, and why, the Mayans decided to incorporate cacao into their theology. First, let’s establish the magnitude of how holy the cacao tree is according to the Popol Vuh, “a colonial document from records of Franciscan friar, believed to be the oldest Maya myth documented in its entirety” (Carla Martin 35). According to the Popol Vuh, a central Mayan God, the Maize God, was sacrificed during harvest time in Xibalba, the Underworld, by the Death Gods. He was later buried and somehow was reincarnated as a cacao tree, albeit quite an anthropomorphic one. The picture below depicts how the Maize God supposedly looked after he was slain and reborn as a cacao tree. A cacao tree with the Maize God’s head as a fruit. There are several instances in Mayan Bowls and Vases that depicts various gods and people as anthropomorphic cacao trees. The Maize God, as a tree, impregnated an Underworld goddess, who subsequently gave birth to the Hero twins, Xbalanque and Hunahpu. Eventually, the Hero Twins “go on to defeat Xibalba and its ghastly denizens” (Coe and Coe 39). They then “resurrect their slain father, the Maize God…[and] rise to the sky in glory as the sun and the moon” (Coe and Coe 39). Within this story alone, it’s undeniable that the cacao tree represents the Gods. It has a God-like quality, and is intrinsically connected to the Mayan idea of holiness. The cacao is not only deeply connected to the integrity of the Maize God, but to many others as described in the Dresden Codex, “Pre-Columbian Maya books written in hieroglyphics” (Carla Martin 34). In the Dresden, “seated gods can be seen holding cacao pods, or dishes heaped with cacao beans” (Coe and Coe 42). Cacao is also frequently seen “being consumed by Gods in ritual activities” (Carla Martin 34). Depicted in a section of the Dresden regarding new year celebrations, the Opossum God is seen carrying the Rain God on his back, with caption being “cacao is his food [kakaw u hanal]” (Carla Martin 34). The Opossum god carrying the Rain God on his back, with cacao apparently sustaining the entire journey. There are several instances, including this one, that describe cacao as foods of the Gods. Whether through the cacao tree or beans, cacao has an incredibly important role in the Mayan religion, as shown by its extensive portrayal in the Popol Vuh and the Dresden. In addition to Gods being portrayed with cacao in some way, the cacao tree is explicitly referred to as the World Tree, which “connects the vertical realms of Sky, Earth, and the Underworld” (Carla Martin 44). This is consistent with how the Maize God was murdered in Xibalba (the Underworld), how he impregnated a woman who escaped into the world’s surface (the Earth), and how the Hero Twins avenged the Maize God’s death and became the sun and the moon (the Sky). The cacao tree is present in nearly all forms of activities of the Gods and of the cycle of nature, of life and death. From the epic of the Maize God to the tales of other Gods, it is obvious that cacao is deeply connected to the Gods. With all this reverence given to the cacao tree, it’s only natural to ask why did the Mayans choose to akin cacao to the Gods? Firstly, the Mayans used their religion as a tool to explain the world around them. Having “had an abiding and intimate relationship with the natural world,” (Simon Martin 154) the Mayans wanted to explain why and how the world around them grows the way it does, so it’s only natural for them to create these mythical stories to do just that. Secondly, because cacao was so integral to the lives of the Mayan and so deeply connected to their way of life, it only makes sense that they so closely kinned the very nature of the cacao to the Gods. Looking closely at the Maize God’s epic death and rebirth, it is clear that the entire story was created to simply explain how their sacred cacao was created, and how it ultimately grows. The act of the Maize God’s dead body giving rise to trees and edible fruits and seeds (enough to impregnate an Underworld goddess) symbolizes germination in nature: “Cacao, the most coveted product of the mortal orchard, was emblematic of all prized and sustaining vegetal growth—with the exception of maize—and the myth served to explain how it and other foodstuffs came into being” (Simon Martin 178). In other words, “the story, then, basically deals in symbolic form with the burial (that is, the planting of the seed), growth, and fruition of maize [and cacao], the Maya-and Mesoamerican-staff of life” (Coe and Coe 39). Essentially, the Mayans used the Gods to explain how and why the nature around the grows (especially their precious cacao), which was used to ultimately explain the phenomenon of life and death. While the Mayans certainly had other reasons in creating their religious tales, there is no doubt that a number of myths, including the Popol Vuh, incorporated cacao to help the Mayans understand the world around them. After all, chocolate was, and is considered divine, so why wouldn’t the Mayans place their cacao in the hands of the Gods in their tales? Coe, Sophie, and Coe, Michael. “The True History of Chocolate. New York: Thames and Hudson, 2013. Martin, Simon. “Cacao in Ancient Maya Religion: First Fruit from the Maize Tree and Other Tales from the Underworld.” Chocolate in Mesoamerica, University Press of Florida, 2009. People and societies are always looking for ways in which to find meaning in their world. Whether it is through creating rituals, forming habits, or connecting with others, humans are constantly looking for ways to find meaning, connection, and a greater purpose. Because of this need to to create values, societies often elevate everyday, mundane aspects of life to something significant and powerful. In Charles Long’s analysis of religion, he explains how religion is about “orientation in the ultimate sense, that is, how one comes to terms with the ultimate significance of one’s place in the world” (Long 7). In order to create a religion and to find meaning in life, societies must orient themselves using the objects and experiences around them. Each society assigns values to different and unique aspects of their daily lives, and for the ancient Maya civilization cacao became an elevated and important aspect substance. Mayas used cacao as a way to understand their place in the world, which elevated cacao to more than just food for sustenance; it became a lens in which they could see the world through. As David Carrasco describes, the tree is “rooted in the underworld, has its trunk in the middleworld, and its high branches or top ascending into heaven or the upperworld: (Carrasco 124). The cacao tree acted as useful visual and tool for the Maya as they sought out ways to understand their place in the world. First and foremost, The Maya used cacao trees as a framework to conceptualize how their place in the world related to the afterlife and underworld. The different parts of the tree correspond to the the different aspects of life and afterlife, with the roots representing the underworld, the trunk representing the present, everyday life, and the leaves connecting to heaven (Carrasco 124). By thinking about these abstract ideas in terms of a understandable visual, it not only elevates the significance of the tree but also makes lofty and complicated ideas more accessible. Further, cacao was used as a powerful safeguard when people transitioned into the underworld. At a tomb in Río Azul (a Maya city in present day Guatamala), ancient jars with traces of chocolate were discovered, suggesting that “the dead lord began his voyage through the underworld with sustaining portions of what were probably several different chocolate drinks by his side” (Coe & Coe 46). Cacao trees not only had connections to the underworld through its roots, but it was also a resource for individuals as they transitioned into life after death. By taking cacao and using it as a means of orienting themselves and their understanding of afterlife, it both elevated cacao’s significance and helped the Maya understand their life cycle. Not only did cacao provide a way to understand life and afterlife, it helped Maya transition into the afterlife comfortably. The Popul Vuh references cacao in a variety of ways, and the story of Hunahpu is just one unique tale demonstrating cacao’s significance. Additionally, the Maya used cacao as a way to conceptualize passing along traits and characteristics from one generation to the next. The Popol Vuh, one of the oldest documented Maya myths, has many references to cacao and helps to demonstrate how valuable cacao was for the Maya and the way in which they viewed the world. The story in the Popol Vuh of the Maize God, Hunahpu, is a myth that describes the sacrifice of Hunahpu (Martin 163). After Hunahpu was killed, his head was placed in a tree that had never grown fruit, yet once his head became a part of the tree it was able to produce fruit in abundance. Because of this, Hunahpu’s offspring, the Hero Twins, were able to carry his legacy with them. As Simon Martin describes, this tale “sets out the divine origins of cacao, as well as its role as a means of exchange. […] Here the fruit serves the purpose it has in nature: a means of generational descent” (Martin 164). Once again, the Maya were able to take a somewhat abstract religious concept and use cacao as a way to understand it. The Hero Twins are the offspring of Hunahpu whose characteristics were carried on through the fruits of the tree in which his head was placed (Martin 163). Finally, the Maya used cacao as a way to provide meaning and significance in various rituals, like baptisms. By bringing cacao into different types of rituals, it extends cacao’s previously established significance in order to assign greater meaning to to new rituals. For example, as Coe & Coe describe, “the pagan Maya had a baptismal rite for boys and girls… The children were gathered together… [and ] then the noble who was giving the ceremony took a bone and wet it in a vessel filled with water made of ‘certain flowers and of cacao pounded and dissolved in virgin water […]’; with this liquid he anointed the children on their foreheads, faces, and in the spaces between their fingers and toes, in complete silence” (Coe & Coe 60). Many religions have baptism rituals, and they each reflect important values within each group of people. For these Maya, cacao is clearly a highly valued and treasured substance that adds greater meaning and connection to this important ceremony. By using cacao as a way to understand and find meaning in the world from understanding the afterlife to baptisms, cacao’s relevance and power were strengthened and it became an important framework for the Maya to understand the world through. Cacao did not have any meaning until the Maya decided to use it as lens for them to see the world through, which goes to show how powerful societies can be in taking something mundane and using it as a tool to create religion and meaning. The narratives around cacao are so strong that we still today associate the Maya with cacao and recognize its significance. For example, Godiva, a popular premium and mainstream chocolate company, references the Maya’s relationship with with cacao, noting its prominence on many Maya artifacts and its place in Maya ceremonies on their website (Godiva website). The Maya were able to take something seemingly mundane, a fruit bearing tree, and use it as a tool to help them understand and interact with the world. This not only helped the Maya create religious significance in their lives, but it completely changed the way we view cacao today and has shaped our understanding of cacao as special and important. 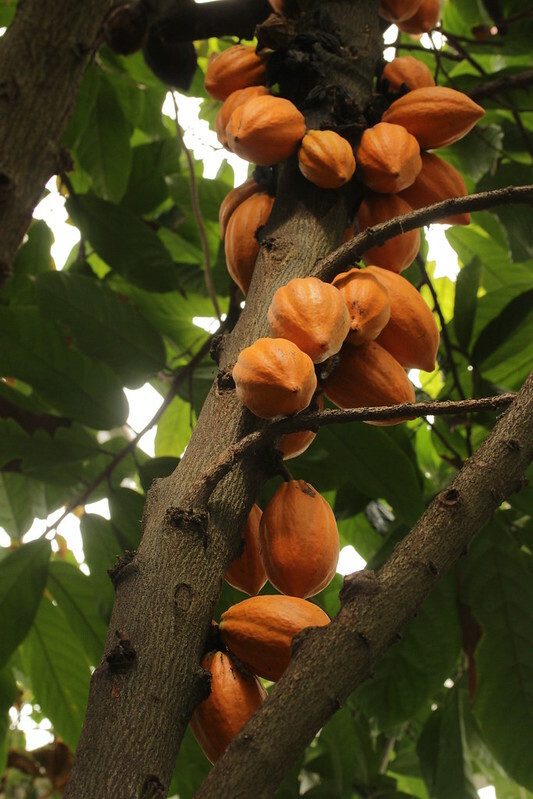 “Cacao Tree and Seedling.” Wikimedia Commons. Web. 30 August 2012. Waveland Press, Inc, 2013. Print. “Hero Twins,” Wikimedia Commons. Web. 25 September 2014. Of Religion. Philadelphia: Fortress Press, 1986. Print. Cacao. Ed. Cameron L. McNeil: Gainesville: University Press of Florida, 2006. “Popol Vuh.” Wikimedia Commons. Web. 17 April 2012. “The History of Chocolate: The Mayans and Aztecs.” Godiva Chocolate, Godiva. Chocoholic Catholics: A Match Made in Heaven or a Sinful Union? As European explorers trekked on journeys beyond the confines of their continent and encountered diverse climates, people, and cultures, they were exposed to a variety of goods and foods for the first time. Integrating aspects of the so-called “New World” cultures and practices into European norms proved challenging for both explorers and the European institutions that were exposed to the new goods upon the explorers’ returns. One institution, the Catholic Church, attempted to incorporate rules about chocolate, one of the most popular food additions from the new colonies, into its canon. However, tensions arose during the church’s attempts to control its followers’ relationships to the food. The consumption of chocolate by devout Catholics remains as controversial, and at times contradictory, today as it was to Catholics in the sixteenth and seventeenth centuries when they first encountered the treat. Despite the widespread rise in popularity of chocolate among members of the Catholic Church during the sixteenth and seventeenth centuries, some Catholic leaders and philosophers of the time were adamantly against the consumption of chocolate, especially during Lenten and fasting periods (Forrest). In 1591 a Catholic philosopher posited that consuming chocolate is equivalent to breaking a fast, reasoning that it quenched thirst, provided nourishment, and served as an aphrodisiac (Coe 149 – 150). That criticism of chocolate did not directly attribute negative qualities to chocolate; instead, it stigmatized chocolate consumption during various hours of the day, going so far as to deem those who consumed it at certain times “sinners.” The oft-posed question of whether or not chocolate could be consumed during a fast underscored the importance that some Catholics placed on classifying chocolate as either good or bad. Chocolate emerged as a polarizing item, and debate around the righteousness of its consumption placed it in a class separate from all other foods and drinks. In addition to deeming it ineligible for consumption during fasts, many Catholics feared a literal death by chocolate. The thick liquid was notorious for its ability to conceal the taste of poison, and for centuries claims circulated that Pope Clement XIV, who is shown in the picture below, was poisoned by a bowl of chocolate (Coe 211). Though the claims were unfounded, the story of Pope Clement XIV’s chocolate-caused death was widely spread. Tales of chocolate poison inspired fear in the masses of drinking their beloved beverage, and the dark side of chocolate created a large source of tension when considered with its widespread popularity. holiday as an excuse to sell their product, individual consumers also consistently include chocolate in their homemade desserts during the holiday season. Pictured below is a Buche Nöel, a cake traditionally made with many types of chocolate that is one of the most popular desserts in France during the Christmas season (“13 Desserts”). Commercial enterprises’ focus on using Catholic holidays to sell chocolate and Catholic consumers seeking out chocolate treats to celebrate Catholic holidays show the enthusiasm with which chocolate has not only been embraced by Catholics broadly, and how it has specifically been embraced to further celebrate their religious beliefs. Notwithstanding chocolate’s modern-day popularity, many members of the Catholic Church consider chocolate consumption a luxurious vice that should be avoided. This is made incredibly apparent when examining modern-day Catholics perception of chocolate during Lent, the forty-day period in observed by Catholics between Ash Wednesday and Easter Sunday during which Catholics give up something important to them in order to repent and diminish sinful tendencies. According to an analysis of Lent-related tweets, chocolate ranked as the number one most commonly forgone item (Mortimer). Pop culture references to the difficulty of going without chocolate during Lent abound, including, for example, an article on the website Buzzfeed entitled “The 21 Stages of Giving Up Chocolate for Lent.” But just what does giving up something for Lent say about that object? An article on Catholic Online explains that Lent “always involves giving up sin in some form. The goal is not just to abstain from sin for the duration of Lent but to root sin out of our lives forever” (“FAQs about Lent”). Applying this definition of Lent to the popularity of giving up chocolate, one can confidently infer that consuming chocolate is considered sinful by the non-negligible number of Catholics who choose to abstain from chocolate during Lent. Through considering Lent and holiday practices, the contradiction between celebrating and vilifying chocolate becomes striking. Many of the same people who use chocolate to observe joyful occasions arguably consider that very same chocolate to be one of their worst vices. Despite the fact that modern-day Catholic laypeople consume a large amount of chocolate and that the Catholic Church has not issued formal criticism of chocolate in centuries, the tension and conflicting opinions that were present in the early days of Catholic chocolate consumption remains. While time-specific contradictions have changed, Catholics’ consistent attempts to classify chocolate as predominantly good or bad have remained both constant and ultimately unsuccessful. Chocolate remains a sinful, beloved luxury. “13 Desserts: A French Christmas Tradition.” Analida’s Ethnic Spoon. N.p., 08 Dec. 2016. Web. 09 Mar. 2017. Dreiss, Meredith L., and Sharon Greenhill. Chocolate: Pathway to the Gods. Tucson: U of Arizona, 2008. Print. Forrest, Beth Marie, and April L. Najjaj. “Is Sipping Sin Breaking Fast? The Catholic Chocolate Controversy and the Changing World of Early Modern Spain.” Food and Foodways 15.1-2 (2007): 31-52. Web. Mortimer, Caroline. “Lent 2016: 10 Things Most People Will (try) to Give up.” The Independent. Independent Digital News and Media, 10 Feb. 2016. Web. 9 Mar. 2017. “FAQs About Lent – Easter / Lent.” Catholic Online. N.p., n.d. Web. 9 Mar. 2017. Prinz, Rabbi Deborah R. “Fathering Chocolate.” The Huffington Post. TheHuffingtonPost.com, 17 June 2013. Web. 09 Mar. 2017. Our understanding of chocolate and the context in which it is consumed has evolved since chocolate was first “founded or created” by the Olmecs. The Mayans and Aztecs had specific customs and beliefs regarding cacao and its consumption in society. These practices have long since been lost in America’s contemporary relationship with chocolate. In this short essay, I will contrast the Mayan and Aztec traditions from our current traditions regarding chocolate; and further, argue that the ritual and religious aspect of cacao has evolved in today’s popular society. Cacao originated in the north-west of South America and thus this area is the cultural center for cacao. Although the Aztecs and Mayans differed slightly in their consumption habits and practices, the cultural significance of cacao still held the same value in their respective societies. Cacao carried both social and religious prestige among the indigenous people. Not only was it called “the food of the gods”, but it was also prized enough to be used as currency. The photo shown to the right depicts the cacao god. Gods were often associated with trees, linking the cacao trees and gods together. Vessels and bowls that once held cacao have been preserved and show us hieroglyphs representing both Gods and cacao; further exhibiting the religious significance of chocolate in their society (Coe 43). Cacao was also revered for its magical and god-like powers. Chocolate was linked to concepts of strength and power; for example “the warriors, the backbone of the Aztec state, were another group permitted chocolate. Cacao, in fact, was a regular part of military rations” (Coe 98). Cacao was an integral part of the Aztec and Mayan religious practices. In rituals the cacao pod was used to symbolize the human heart torn out for sacrifice (Coe 103). However, cacao’s power in Mayan and Aztec society extended beyond that of religion and military. Cacao played a significant role in banquets, baptisms, weddings, and burials. Cacao was also integrated in marriage rituals. For example, it was normal for the father of the potential bride to invite the father of the boy to discuss the marriage proposal over a chocolate beverage. Additionally, cacao was often given as a dowry. These practices show what a compelling force chocolate was to the Aztecs and Mayans. While chocolate still has a strong presence today, it does not carry the same significance to us as it did to Aztecs and Mayans; yet, I would argue that we still have a ritualistic connection to chocolate. The industrialization of the food industry, while benefiting the capitalist side of the chocolate industry, took away the religious and traditional aspect of chocolate. With the invention of preserving, mechanization, retailing, and transporting, chocolate and other food stuffs become readily available and easily accessible to the public at large. Not only did industrialization make foodstuff less perishable but it also made it easier to disperse; “critical to the growth of the overseas trade was the development of large cargo ships capable of transporting the raw materials to the metropolitan country in exchange for the mass export of manufactured goods” (Goody 82). The graph depicted on the left is from 2009 and shows the consumption of chocolate each year, consumed per person in pounds. The industrialization, mass production, and exportation of chocolate has led to a completely different public sentiment towards chocolate. In comparison to during the Aztec and Mayan era, because of its affordability, chocolate has become less of a luxury item. The invention of technology like the conch, the five roller refiner, and the hydraulic press have made chocolate manufacturing more efficient. The Mars company was famous for its efficiency in chocolate production. They employed engineers to improve the efficiency of their machines and “the result of this effort was the most efficient candy-making operation in the business” (Brenner 83). Mars additionally, created the Snickers bar that was only coated in chocolate, reducing its price and increasing its affordability; thereby, making their chocolate bars even more competitive in the free market. But despite chocolate lacking its previous characteristic as a luxury item, it still retains the quality of being an indulgent good. Thus, one could argue that the ritualistic aspect of chocolate is its mass and quite often consumption. Further, chocolate still carries significance on certain religious holidays. For example, chocolate is central in the victorian creation of Valentine’s day. Chocolate has become an essential consumerist part of the festivities. The video featured above was Starbuck’s 2017 Valentine’s day commercial, starring: chocolate. Generally the celebration of Valentine’s day is heteronormative as well as consumerist. This Valentine’s day commercial doesn’t play off of the normal gender binary, but, it does clearly link chocolate to the celebration. Chocolate is still an important part of religious holidays like Christmas and Easter. Yet, while its place in the celebrations is solidified, its religious significance is not quite as apparent as it was under the Aztecs and Mayans. Thus, while chocolate is no longer the star of athletics, marriages, weddings, baptisms, burials, or rituals, its presence is still prominent in many of our religious celebrations. The mass distribution and consumption of chocolate has taken away from its spiritual and traditional uses in society. Yet, this same commercialism and mass distribution has allowed chocolate to remain a constant power and presence in today’s society. Brenner, JoeÌl Glenn. The Emperors of Chocolate: Inside the Secret World of Hershey and Mars. New York: Broadway, 2000. Print.